PAUL, Minn. — When Demariay Gunn starts kindergarten next fall, he will know how to print his name, count to 10 and recite his ABC’s. He’ll know how to line up to play outside and how to wash his hands after using the bathroom. He will also know that even when he’s frustrated, he shouldn’t scream in a friend’s ear. The 4-year-old with an impish smile is benefiting from Minnesota’s experiment with early education. He receives a $5,000 state scholarship to attend a private childcare center, New Horizon Academy in St. Paul. Without public help, the $13,000 annual fee is more than his single mom can afford on her wages as a caregiver for the elderly. The hope is that preschool will give Demariay a leg up in kindergarten, help him learn to read by third grade and even increase the odds that he’ll graduate from high school. As the Obama administration makes early childhood education a top domestic priority and most states are expanding preschool for low-income kids, Minnesota is taking a unique approach. It is the first state to make a major investment in a market-based preschool subsidy. So-called “early learning scholarships” follow children, whether they enroll in a public school pre-kindergarten or federal Head Start, which the government pays for anyway, or a private center like New Horizon or home daycare that charges fees. The scholarships, essentially pre-kindergarten vouchers, are designed to steer the most at-risk kids into the highest-quality care and reduce the achievement gap at the outset. “It is something that other states are watching,” said Cisa Keller, director of government and community relations for New Horizon, which runs 60 for-profit centers in Minnesota. Nearly 6,000 children received scholarships last school year, and roughly the same number will get them this year through a $27 million annual allocation. In his new budget, Gov. 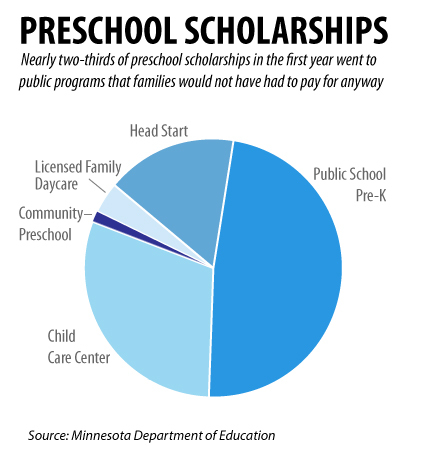 Mark Dayton proposes keeping the scholarships with some changes, and meanwhile creating a new universal statewide prekindergarten run by local school districts. State officials say the $5,000 scholarships are allowing children to have high-quality care more consistently or for the first time, but the program faces many challenges. Funding only reaches 10 percent of eligible children, 3- and 4-year-olds whose parents make less than 185 percent of the poverty line, or $38,000 for a family of four. The $5,000 covers less than half the cost of full-time private care, though the maximum scholarship may be raised in 2015. And since most of the $27 million allocation is going to public pre-kindergarten and other options already free to families, critics question whether the scholarships truly promote parent choice. Meanwhile, only a fraction of eligible settings have been evaluated. There are also questions about whether the state’s quality benchmarks are high enough to produce the results policymakers hope to see. Children in the preschools were better prepared for kindergarten, less likely to use special education and more likely to graduate and go to college. They were also less likely to go to prison and have poor health as adults. “Early childhood is probably the best economic investment we can make as a society,” said Rolnick, now a senior fellow at the University of Minnesota’s Humphrey School of Public Affairs. Backed by a group of Minnesota business leaders, he proposed a scholarship pilot that was tested in four Minnesota communities, including St. Paul, from 2008 to 2011. Results were promising as the pilot enrolled children at younger ages, assigned mentors to parents and paid up to the cost of full-time care. But when scholarships went statewide, those beefy supports were scrapped to cut costs and reach more children. 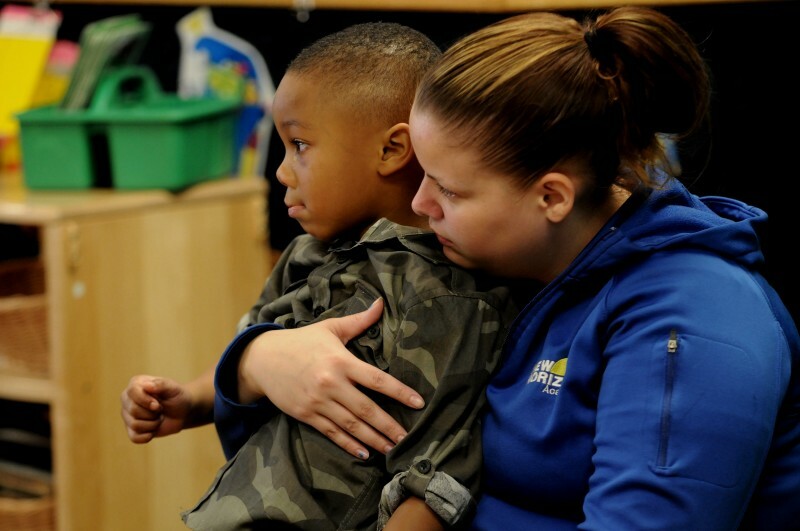 Crucial to the program’s success is steering parents toward quality. To do that, the state developed a voluntary rating system called Parent Aware, overseen by the Department of Human Services. Providers are awarded one to four stars for measures that go beyond health and safety licensing requirements. For the highest rating, evaluators visit in person to observe how caregivers interact with children. Unlike national accreditation, Parent Aware is free for the providers. It comes with coaching on how to create an improvement plan and even grants to purchase curriculum or classroom supplies. Getting programs into the system has been a challenge. There are 10,000 locations where Minnesota 3- and 4-year-old children receive care. So far, 20 percent of them have applied to be rated through Parent Aware. Public programs like Head Start and school district pre-k zipped through the application process on a fast track and most received the highest quality rating of four stars. 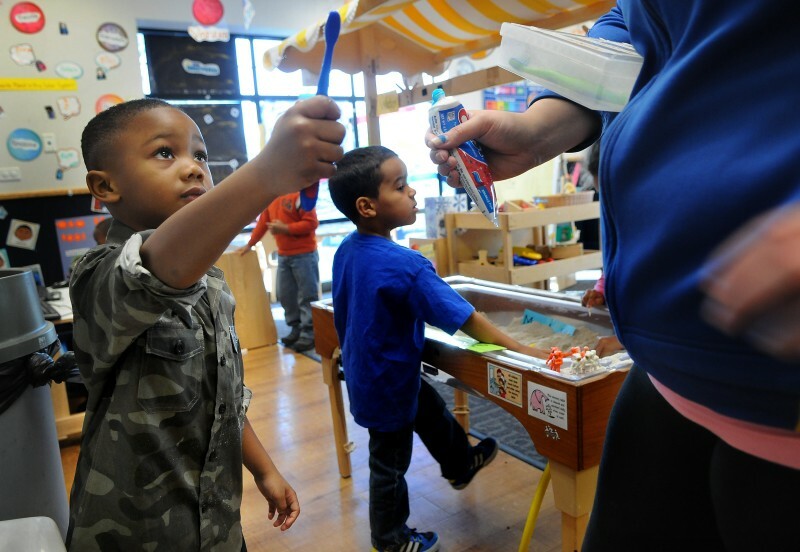 Private preschools that already had a national accreditation also went through a fast track. Private daycare centers and family daycares, however, are entering slowly. Only one in 10 non-accredited centers and fewer than one in 20 home daycares have applied, and most have received only one or two stars. Measuring quality is tricky, and some question whether even all four-star programs are giving children the enrichment they need. New Horizon — the preschool center that Demariay Gunn attends — has four stars and 22 children in its 4-year-old class. 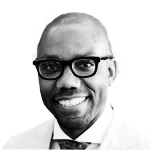 But according to Arthur Reynolds, co-director of the Human Capital Research Collaborative at the University of Minnesota’s Humphrey School of Public Affairs, preschools that give kids the biggest long-term boost have no more than 17 children for every two teachers. Reynolds has studied the effects of a model Chicago preschool for decades and recently helped start a similar initiative in five St. Paul schools. Kids do best when teachers are well paid, parents are engaged and supports continue into elementary school, he said. His most recent research also shows that low-income kids benefit far more from full-day preschool than half day. So where are kids ending up? In the first year, half the kids on scholarships were in public school pre-kindergarten, and another 16 percent were in Head Start. This is largely because of a compromise in the way the state distributed money: Half the scholarship funds went directly to existing four-star sites, mostly public schools. 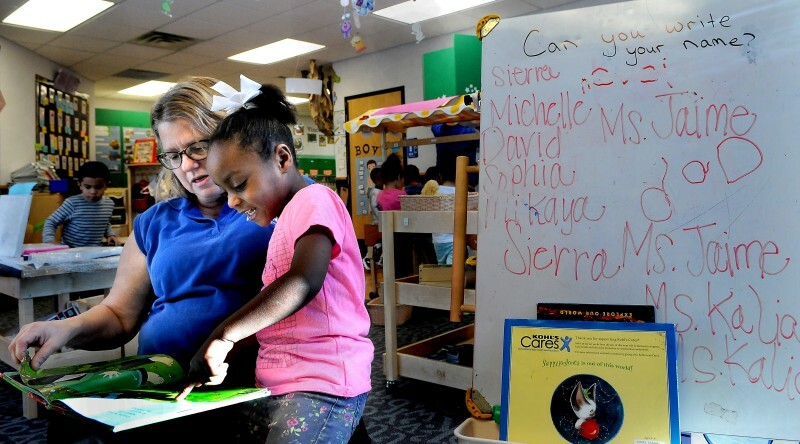 Saint Paul Public Schools, for example, received nearly $800,000 in scholarship funds this year to add eight pre-kindergarten classes, boosting the total number of classes to 45 and enrolling 161 children off a wait list of several hundred. Preference is given to children who are low-income, with special needs or from non-English-speaking households. The compromise was meant to increase spots at four-star sites and get money to schools. The concern, borne out in the first year, was that most parents would not hand $5,000 to a school district where their children could attend pre-kindergarten for free, and the family would then use their scholarship to pay for additional part-time care elsewhere. Some stakeholders question whether the way the money was distributed is consistent with the intent of the legislation creating the program. A progress report on Minnesota’s early education reform from the non-profit advocacy organization Parent Aware for School Readiness criticizes scholarships for not giving parents “the level of choice, empowerment and portability” available in the pilot. Dayton’s plan would address this by giving all scholarship money directly to families, essentially doubling the money available for parent choice, and expanding free school district prekindergarten with new state funds. He also wants to make scholarships available to any low-income child younger than five, including infants. Overall, a third of scholarships in the first year were used at private centers. Only 4 percent of scholarship kids used home daycare. Former public school teacher May Lee runs one of the few home daycares with four stars. Lee, whom children call “Auntie,” brings a classroom routine to her East St. Paul living room, practices shapes and colors with the nine children in her care and reads them books like Brown Bear, Brown Bear, What Do You See? Some families choose her for the hours, from 7 a.m. to 5:30 p.m. Others like the nurturing atmosphere and Hmong culture. When one family could not afford her fees, Lee helped the 4-year-old boy get a scholarship. The extra $5,000 enabled him to attend full time. Lee has seen the boy become more respectful and confident. “I hope that will continue as he goes to school, because I know he will not get much support at home,” Lee said. But the scholarship is almost gone, and when the money runs out, Lee will face a dilemma: whether to keep the child part-time when she could fill his slot with a child whose parents can pay for full-time. Many families are using the scholarships like this one is: as a supplementary pot of money to pay for full-time, year-round care when other funds aren’t enough. New Horizon opened its Rice Street location in 2008 because pilot scholarships were available to help parents in the low-income neighborhood pay $268 a week for full-time care. Twenty-four children at the center receive scholarships. All 80 children, infants through 4-year-olds, also receive child-care assistance, a state subsidy for the working poor and welfare recipients that can stop suddenly when a parent stops working. Now, the scholarship pays her child-care assistance co-pays, which vary from a few dollars to $70 per week, she said, according to her work hours.